The Philadelphia Eagles will send defensive tackle Fletcher Cox, tight end Zach Ertz and right guard Brandon Brooks to the Pro Bowl. Philadelphia Eagles quarterback Carson Wentz is not expected to play Sunday night versus the Rams and his immediate future is uncertain with a stress fracture in his back. Philadelphia Eagles defensive end Derek Barnett will miss the remainder of the 2018 season and undergo shoulder surgery. The injury bug is still bitting the Philadelphia Eagles with the news of safety Rodney Mcleod requiring surgery on his knee. The Philadelphia Eagles have finalized their 53-man roster for the 2018 season. The team has also announced it has acquired safety Deiondre’ Hall in a trade with the Chicago Bears. 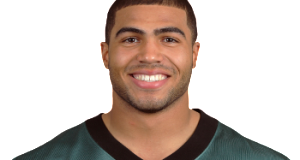 Former Philadelphia Eagles linebacker Mychal Kendricks has been charged with insider trading, according to multiple reports. The Philadelphia Eagles have announced the signing of safety Deshawntee Gallon and have cut linebacker Corey Nelson.